Wide auxiliary supply: 7 Vto 35\/DC. Withstands a dip to OV of auxiliary supply for 0.5 second. Alphanumeric LCD displays with keypad for ease of operation. 24 < LED for annunciation of status of various faults/inputs. 10 LEDs are user programmable. 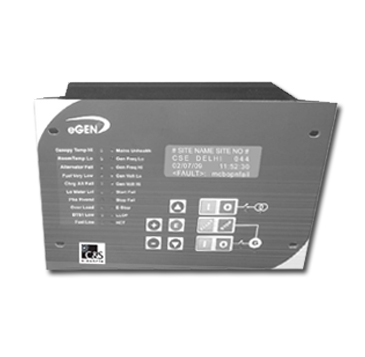 eGen+ is designed for the control of emergency and standby power systems. lt integrates the functions of engine start relay, engine and alternator supervision and annunciation.eGen+ measures and displays various parameters like voltages, currents, power factors, active power consumed in all the three phases. lt also measures the energy consumed by the load. The display of month-wise energy consumption is also available in its non volatile memory. eGen+ provides overload protection and the permissible overload limit can be selected on the relay. The actual load current is displayed by setting the CT ratio The relay has excellent communication features including GPRS/GSM and SMS connectivity through modem and any fault event can be immediately conveyed to the base station or to the concerned persons. Provision for operating 12 Auxiliary relays [externally mounted] for control, annunciation and protection purpose. 6 relays are user programmable. 16- Opto-Isolated Digital Inputs, lO inputs are user Programmable. Last 50 Event record with non volatile memory backup.